The Keaton Studio barn as it appears in The Blacksmith, left, looking west down Eleanor towards Cahunega, and as it appears looking east from Cole Avenue, in Sherlock Jr. Click the photo to see the tiny barber shop (left), and at right the back of the barber shop and two bungalows, all discussed later below. The new material runs for over four minutes, and involves novel jokes, characters, and settings that differ from the widely distributed version of the film available from Kino-Lorber. For example, the Virginia Fox character now has a father who makes an appearance, while Buster and Big Joe Roberts chase each other around a small set, barely more than a shed, designated as the local “Chamber of Commerce.” Buster also attempts to propose to Virginia, pleading he won’t always be a blacksmith, which makes more plausible their elopement later in the film. The Chamber of Commerce shed built for the novel scenes from The Blacksmith stood on a small vacant lot on Cahuenga directly across the street from the Keaton Studio, and appears in a couple of circa 1922 aerial photographs of the site. The tiny shed’s appearance in these photos had always puzzled me, but thanks to Mr. Pena’s discovery, I now know what the shed was and why it was there. The shed stood on the same vacant lot where Buster would later build the dormitory set for his 1927 feature College. 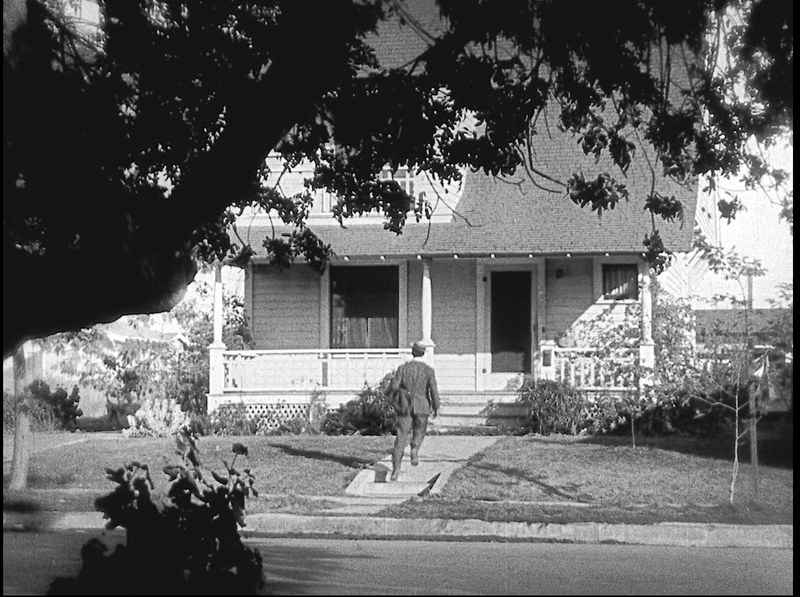 The novel footage from The Blacksmith provides another view from the Keaton Studio towards the house standing to the west on 1022 Cole Avenue. The house not only appears behind the studio fence during scenes from The Boat (1921) (above) and in Day Dreams (1922), but also portrayed Katherine McGuire’s home (to the right) in Buster’s 1924 feature Sherlock Jr.
Circa 1921. At left, the ESCAPED poster set from The Goat beside the open air filming stage – at right the back of 1022 Cole Avenue from The Boat. The empty lot covered by the two movie frames is where the Chamber of Commerce shed would later be built for The Blacksmith. The Keaton Studio barn stands at the bottom. The new footage from The Blacksmith also helps to pinpoint the time the Keaton Studio upgraded from an open air filming stage to a more modern closed over stage. As shown above, the shooting stage remained open to the elements during the filming of Keaton’s The Goat in 1921. The novel images from The Blacksmith below show that the former open air stage was by then covered over, suggesting the stage construction might have taken place later in 1921. Click to enlarge. NEW FOOTAGE at left. The view looks east from the vacant lot on Cahuenga towards the Keaton Studio across the street. By now the filming stage is covered over. 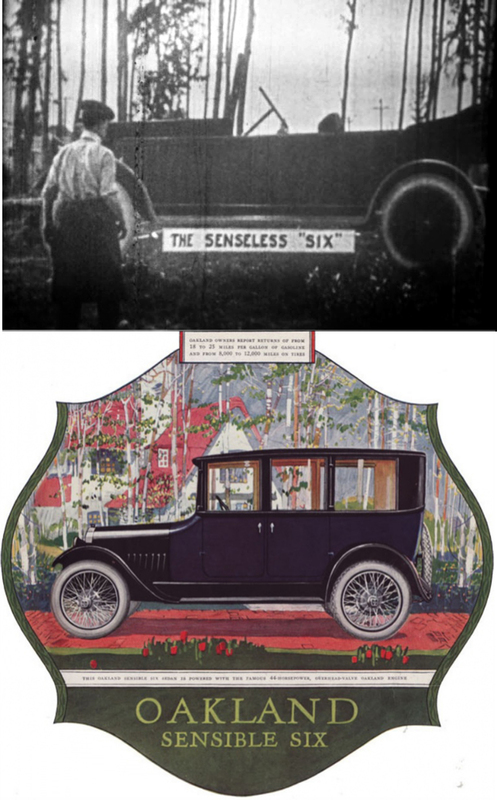 During the novel scenes, Buster encounters a prop billboard that looks like an automobile, labelled with a sign that reads “The Senseless ‘Six’,” a pun spoofing the Oakland Sensible Six touring sedan. The billboard was built on the same vacant lot near the Chamber of Commerce set. The shot above shows Buster climbing from under the back of the sign. 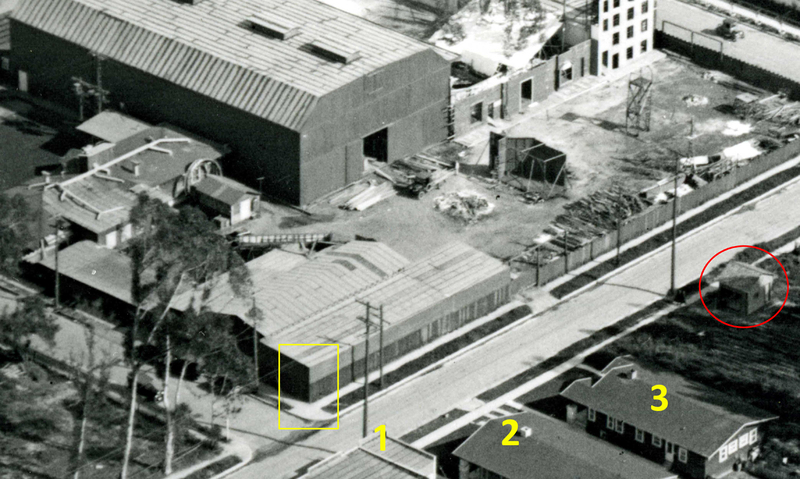 Although the above image is confusing, if you look closely you will first discern the steering wheel and the outline of the car, then further back the Keaton Studio fence across the street, with its pattern of alternating taller and shorter fence boards, and then beyond the jumble of sheds, doors, and roof edges that comprise the west side of the studio. 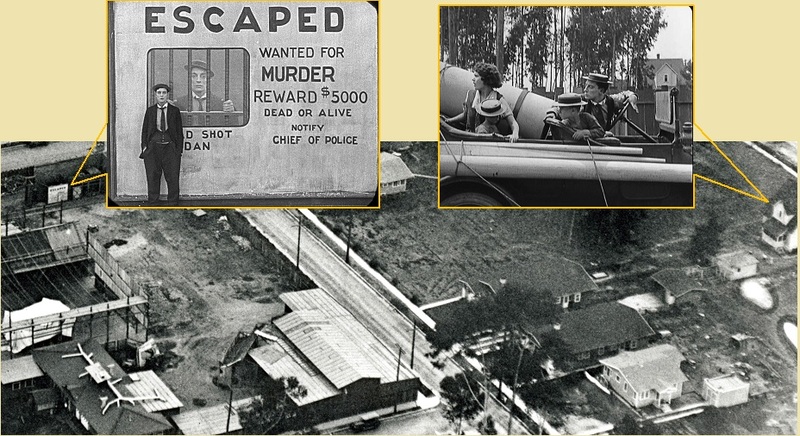 I already knew that by 1923 the Keaton filming stage was covered over, when Buster shot The Balloonatic, because you can see the covered stage in the far left background during the balloon launching scene (at right), filmed from a different vacant lot east of the studio. [[New info: the building permit for the covered stage was issued October 20, 1921. Keaton was filming The Paleface at that time, which was filmed nearly entirely outdoors.]] 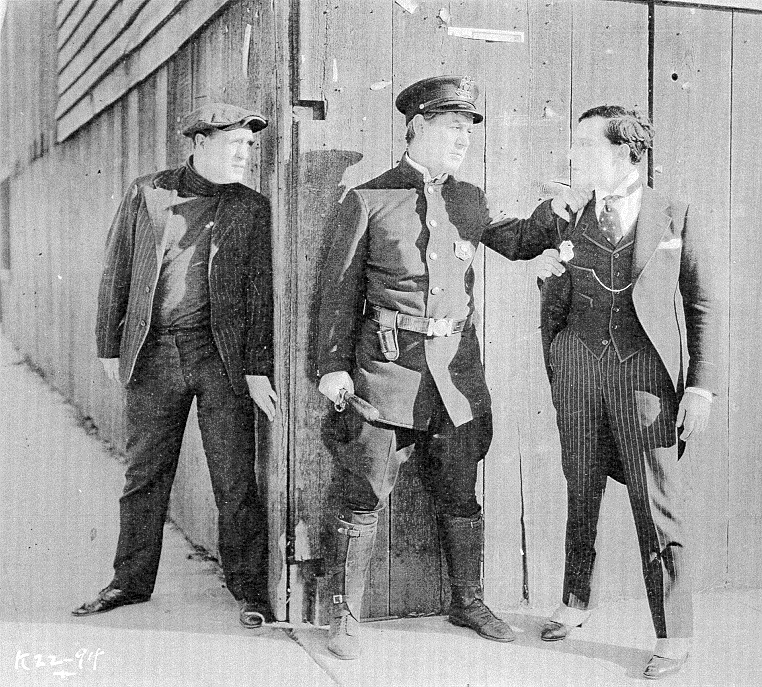 Buster’s famous short film Cops (1922) was filmed during December 1921 – January 1922, immediately preceding The Blacksmith. Interestingly, Cops is the only Keaton movie that has no interior scenes whatsoever. Presumably the large covered stage took several weeks to complete, and thus was finished some time during the production of Cops. Is it possible Cops was deliberately structured with no interior scenes in order to give the studio carpenters free reign to complete their work? Of further interest, although The Blacksmith was reportedly shot during January – February 1922, it was held back, and released out of order on July 21, 1922, only after the June 12, 1922 release of Keaton’s subsequently produced short My Wife’s Relations. Moreover, as demonstrated in my next post, visual clues show there was a months-long gap between filming scenes for the movie, as confirmed by newspaper accounts reporting the production was originally completed in August 1921! But because Mr. Pena’s version contains scenes filmed in 1922, it can not be the initial 1921 version of the film. The version of The Blacksmith known in America today was discovered by James Mason in Keaton’s private vault (Mason was a subsequent owner of Keaton’s Italian Villa mansion in Beverly Hills). This “American” version appears to date from mid to late 1921, and does not contain any of the “Pena” scenes filmed in 1922. 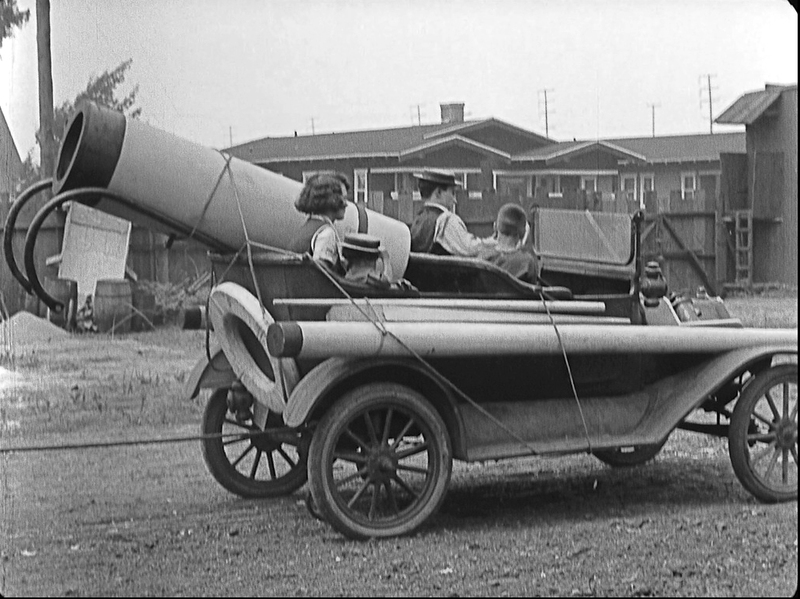 Thus, it is plausible Buster’s privately held 1921 vault print was not intended for wide distribution, and that the “Pena” version, containing numerous subsequently filmed gags, was the “official” version widely released in July 1922. You can read more about the clues in my second and third posts. 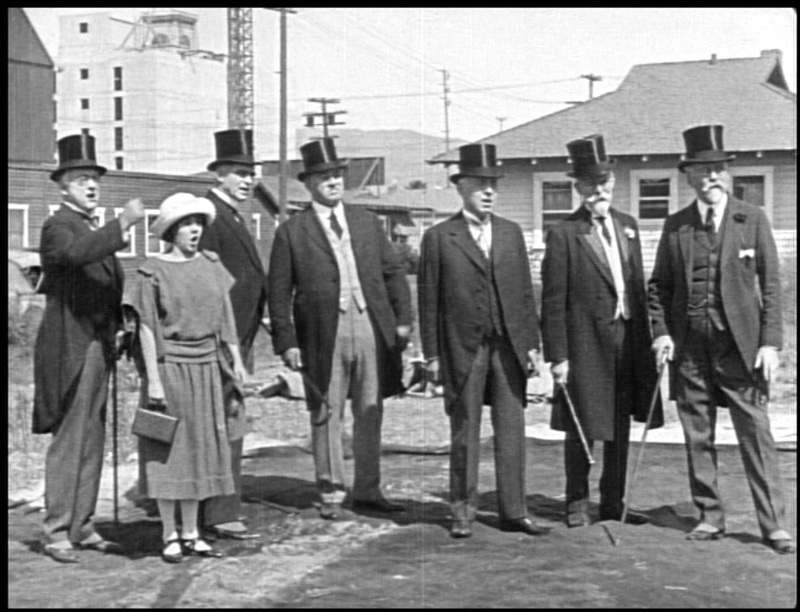 Closing this post, above is a circa 1920 view, looking to the NW, of the small vacant lot on Cahuenga, across from Buster’s studio, where the novel Chamber of Commerce shed would later be built. Below is the back of the shed, with a matching view, looking north, of the twin bungalows across from the studio, as they appear during Keaton’s feature comedy College. The red ovals below mark a unique feature on the side of the barber shop discussed at the top of this post. NEW FOOTAGE left, a scene from Keaton’s College, right, both looking north up Cahuenga and showing the bungalow porches across from the Keaton Studio, and the south side of the barber shop discussed above. The same bungalows on Cahuenga shown above also appear across the street (at right) during this scene from The Boat. In all, Keaton filmed over four dozen scenes and insert shots for his movies at or adjacent to his small studio. You can read about further studio appearances in Day Dreams and in Sherlock Jr. at this prior post Mr. Keaton’s Neighborhood. 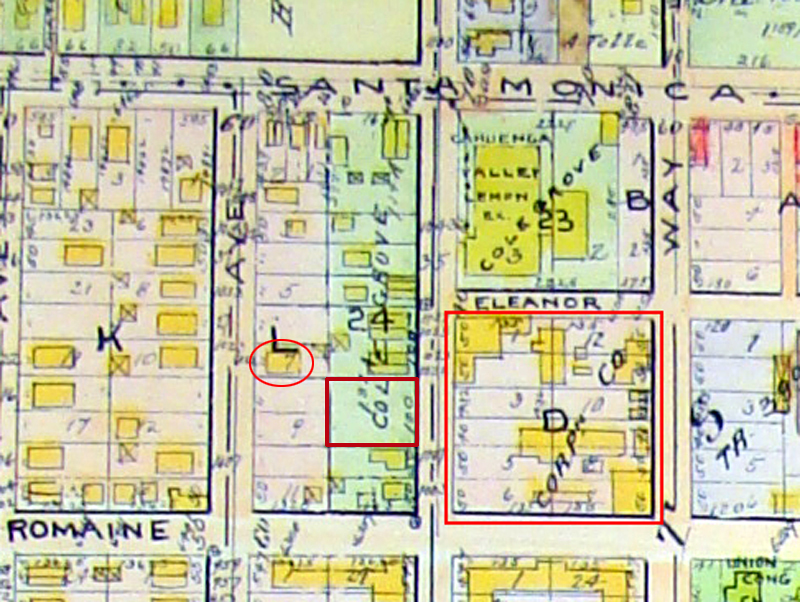 The Keaton Studio, circa 1921, within Lillian Way, Eleanor, Cahuenga, and Romaine – the barn to the upper left, with 1022 Cole Avenue (oval) and the vacant filming lot (brown box) across from the studio. All NEW FOOTAGE scenes provided courtesy of Mr. Fernando Pena, to whom I extend my congratulations and sincere appreciation for sharing his remarkable discovery. All other Keaton movie frame images licensed by Douris UK, Ltd. 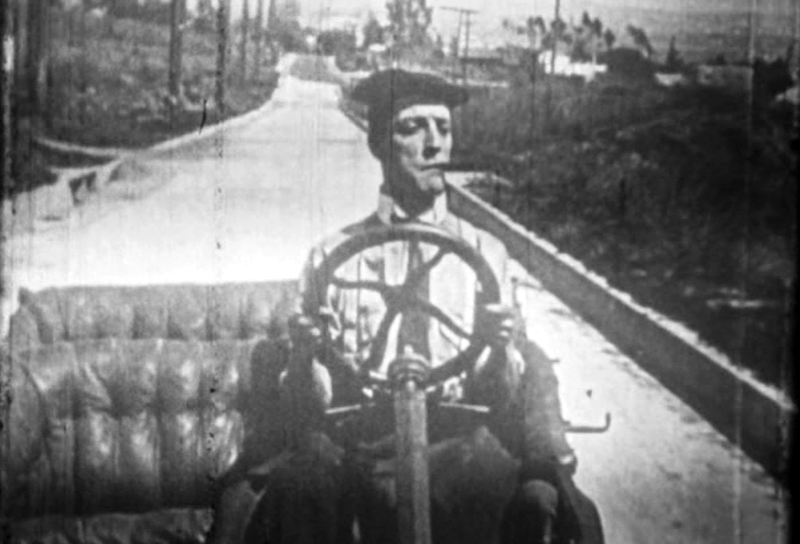 This entry was posted in Buster Keaton, Keaton Studio, The Blacksmith and tagged Argentina, Buster Keaton, Fernando Pena, Fritz Lang, Hollywood, Keaton Locations, Keaton Studio, Metropolis, Silent Comedians, Silent Comedies, Silent Movie Locations, Silent Movies, The Blacksmith, then and now, Variety. Bookmark the permalink. I follow this blog and stop in here each and every time you post some new information. I love it all and never let you know so here it is – KEEP IT COMING! Reblogged this on Once upon a screen…. Endless fascination, John. A lot of good research and detective work goes into your posts… something that appeals to my own professional background, along with the film history. BTW: That was excellent news about the discovery of a full length version of the classic “Metropolis”. No history of the silent era is complete without a study into the German filmmakers of that time. Great post, John! Many thanks for your kind words. Than YOU Fernando. Everyone is so excited to hear about your discovery. The San Francisco Silent Film Festival showed slides on the screen between the scheduled movies that explained the news of your discovery, and quoting from the Variety story. I had the privilege today to see with my son both the standard cut and the newly found french titled version of The Blacksmith presented by Mr. Fernando Peña himself with excellent musicians playing live to the screenings in Buenos Aires, at Studio 1 of Canal 7 (Argentine Public TV Station). That sounds wonderful Matias – thank you for sharing!